Record added: Mar 15, 2013. 1880 United States. Census Office. 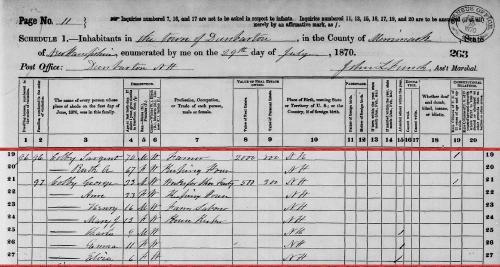 10th census, 1880 federal population census, Washington, District of Columbia: National Archives and Records Service, ([19--]) , Census Place: Hopkinton, Merrimack, New Hampshire; Roll: 766; Family History Film: 1254766; Page: 355C; Enumeration District: 183; Image: 0539. 1900 United States. Census Office. 12th census, 1900 population census schedules, Washington, District of Columbia: Bureau of the Census Micro-Film Laboratory, ([197-]) , Census Place: Hopkinton, Merrimack, New Hampshire; Roll: 949; Page: 4A; Enumeration District: 0168; FHL microfilm: 1240949. He was the son of Samuel Colby and Louisa A. Phillips. New Hampshire. Registrar of Vital Statistics, Index to deaths, early to 1900, Salt Lake City: Filmed by the Genealogical Society of Utah, (1974) Microfilm #1001068 of the Family History Library, Salt Lake City, Utah. Find A Grave Memorial# 95471551.
living at Concord, Merrimack County, New Hampshire. "New Hampshire, Marriage Records, 1637-1947," index and images, FamilySearch (https://familysearch.org/pal:/MM9.1.1/FLH8-49C : accessed 22 Nov 2012), Bela B. Whitney and Emeline B. Bell and null, 1889. 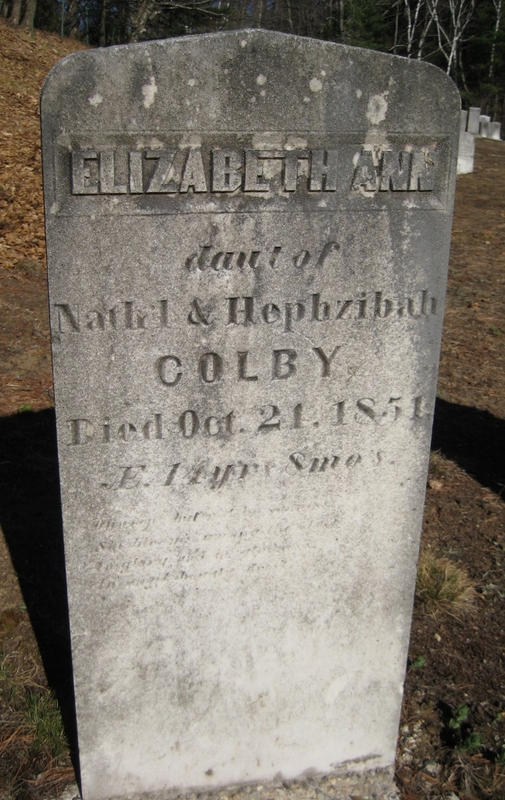 She was the daughter of Philip Colby and Hannah Bailey. COLBY FAMILY & OTHERS at http://freepages.genealogy.rootsweb.com/~colby/colbyfam, /d115.html. Church of Jesus Christ of Latter-day Saints. Manti Temple, Sealings for the dead, couples and children (includes some living spouses and children), 1944-1970; heir index, 1944-1972, Salt Lake City: Filmed by the Genealogical Society of Utah, (1957-1971) , Film Number: 458524. Harrison Colby, A genealogy of the descendants of Abraham Colby and Elizabeth Blaisdell, his wife, who settled in Bow in 1768, , at https://archive.org/details/genealogyofdesce00colb . Concord, N.H.: Printed by the Republican Press Association, (1895) Microfilm #896944 of the Family History Library, Salt Lake City, Utah, p. 56. "New Hampshire, Marriage Records, 1637-1947," index and images, FamilySearch (https://familysearch.org/pal:/MM9.1.1/FLXF-S4L : accessed 15 Dec 2012), Charles G. Kimball and Emma J. Colby and null, 1880. "New Hampshire, Death Records, 1654-1947," index and images, FamilySearch (https://familysearch.org/pal:/MM9.1.1/FSVK-BM9 : accessed 15 Dec 2012), Howard E. Kimball, 20 Apr 1926. "New Hampshire, Birth Records, Early to 1900," index and images, FamilySearch (https://familysearch.org/pal:/MM9.1.1/FLGZ-RJW : accessed 16 Dec 2012), Kimball, 05 Apr 1884. "New Hampshire, Birth Records, Early to 1900," index and images, FamilySearch (https://familysearch.org/pal:/MM9.1.1/FLG8-3S9 : accessed 15 Dec 2012), Howard Everett Kimball, 24 Apr 1889. 1900 United States. Census Office. 12th census, 1900 population census schedules, Washington, District of Columbia: Bureau of the Census Micro-Film Laboratory, ([197-]) , Census Place: Derry, Rockingham, New Hampshire; Roll: 950; Page: 1B; Enumeration District: 0187; FHL microfilm: 1240950. "New Hampshire, Death Records, 1654-1947," index and images, FamilySearch (https://familysearch.org/pal:/MM9.1.1/FSVT-DY7 : accessed 15 Dec 2012), Bessie A. Kimball, 05 May 1903. 1910 United States. Bureau of the Census. 13th census, 1910 population census schedules, Washington, District of Columbia: Bureau of Census Micro-Film Lab, ([19--?]) , Census Place: Derry, Rockingham, New Hampshire; Roll: T624_865; Page: 4B; Enumeration District: 0240; ; FHL microfilm: 1374878. "New Hampshire, Marriage Records, 1637-1947," index and images, FamilySearch (https://familysearch.org/pal:/MM9.1.1/FLDZ-4RX : accessed 16 Dec 2012), Harry C. Kimball and Mildred Stevens and null, 1910. 1920 United States. Bureau of the Census. 14th census, 1920 population census schedules, Washington, District of Columbia: The National Archives, ([193-?]) , Census Place: Derry, Rockingham, New Hampshire; Roll: T625_1013; Page: 1B; Enumeration District: 116; Image: 681. "New Hampshire, Death Records, 1654-1947," index and images, FamilySearch (https://familysearch.org/pal:/MM9.1.1/FSVT-6NB : accessed 16 Dec 2012), Emma J. Kimball, 13 Sep 1924. Harrison Colby, A genealogy of the descendants of Abraham Colby and Elizabeth Blaisdell, his wife, who settled in Bow in 1768, , at https://archive.org/details/genealogyofdesce00colb . Concord, N.H.: Printed by the Republican Press Association, (1895) Microfilm #896944 of the Family History Library, Salt Lake City, Utah, pp. 145-6. "Mr. Enoch Colby, aged 48 years" by Jane Anthony Davis. 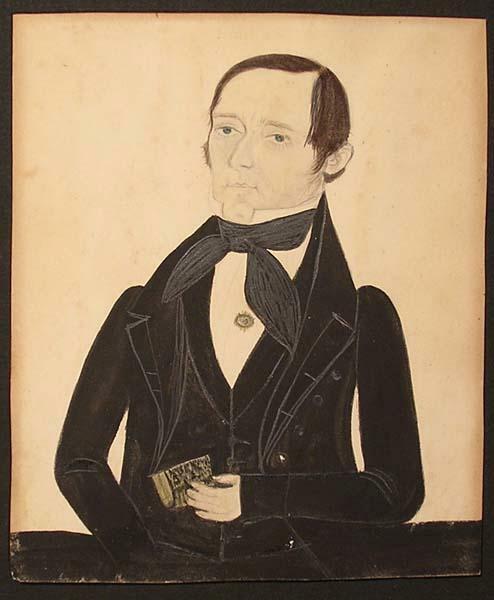 Enoch Colby was born on July 2, 1790. He was the son of Jonathan Colby and Martha Alexander. 1790 United States. Census Office. 1st census, Census schedules, 1790, Washington [District of Columbia]: The National Archives, (1969) , 1790 > NEW HAMPSHIRE > ROCKINGHAM > BOW, Series: M637 Roll: 5 Page: 254. COLBY FAMILY & OTHERS at http://freepages.genealogy.rootsweb.com/~colby/colbyfam, citing FHL Number 1000976; Marriage: Polly BAMFORD; Date: 03 Aug 1812; Recorded in: Birth and Marriage Index for New Hampshire. COLBY FAMILY & OTHERS at http://freepages.genealogy.rootsweb.com/~colby/colbyfam, citing Early Vital Records of Middlesex County, Massachusetts to 1850 for Lowell. "New Hampshire Death Records, 1654-1947," database with images, FamilySearch (https://familysearch.org/ark:/61903/1:1:FSKJ-F6L : 12 December 2014), Converse S Colby, 09 Jan 1897; citing Laconia, Bureau Vital Records and Health Statistics, Concord; FHL microfilm 1,001,068. He was the son of Hezekiah Colby and Sarah or Judith Sargent. living at New Boston, Hillsborough County, New Hampshire. Lineage Book of the National Society of Daughters of Founders and Patriots of America, , Vol. 52, p. 377. Joseph Dow, History of the town of Hampton, New Hampshire: From its settlement in 1638, to the autumn of 1892, Vol. 2, , at https://archive.org/details/historyoftownofh02dowj . Salem, Mass. : Printed by the Salem Press Publishing and Printing Co., (1894) , Vol. 2, p. 947. Amesbury (Mass. )., Vital records of Amesbury, Massachusetts, to the end of the year 1849., Page: 600 p. ; 24 cm. (n.p. : Topsfield Historical Society, Topsfield, Mass., 1913, unknown publish date), p. 56. Vital records of Amesbury, Massachusetts to the end of the year 1849, , at https://archive.org/details/vitalrecordsofam00ames . Topsfield, Mass. : Topsfield Historical Society, (1913) , p. 60. Vital records of Amesbury, Massachusetts to the end of the year 1849, , at https://archive.org/details/vitalrecordsofam00ames . Topsfield, Mass. : Topsfield Historical Society, (1913) , p. 405. "New Hampshire Birth Records, Early to 1900," database with images, FamilySearch (https://familysearch.org/ark:/61903/1:1:FL2T-SYN : 12 December 2014), Seth Colby, 09 May 1789; citing Salisbury, Merrimack, New Hampshire, United States, Bureau of Vital Records and Health Statistics, Concord; FHL microfilm 1,000,378. "New Hampshire Birth Records, Early to 1900," database with images, FamilySearch (https://familysearch.org/ark:/61903/1:1:FL2R-P8R : 12 December 2014), Enoch Colby, 28 Aug 1791; citing Salisbury, Merrimack, New Hampshire, United States, Bureau of Vital Records and Health Statistics, Concord; FHL microfilm 1,000,378. "New Hampshire Birth Records, Early to 1900," database with images, FamilySearch (https://familysearch.org/ark:/61903/1:1:FL2R-P8B : 12 December 2014), Enos Colby, 20 Dec 1794; citing Salisbury, Merrimack, New Hampshire, United States, Bureau of Vital Records and Health Statistics, Concord; FHL microfilm 1,000,378. "New Hampshire Birth Records, Early to 1900," database with images, FamilySearch (https://familysearch.org/ark:/61903/1:1:FL2R-2JX : 12 December 2014), Betsy Colby, 28 Jun 1796; citing Salisbury, Merrimack, New Hampshire, United States, Bureau of Vital Records and Health Statistics, Concord; FHL microfilm 1,000,378. "New Hampshire Birth Records, Early to 1900," database with images, FamilySearch (https://familysearch.org/ark:/61903/1:1:FL2R-RP1 : 12 December 2014), Hannah Colby, 22 Jul 1800; citing Salisbury, Merrimack, New Hampshire, United States, Bureau of Vital Records and Health Statistics, Concord; FHL microfilm 1,000,378. John J.Dearborn, The History of Salisbury, New Hampshire, , at https://books.google.com/books?id=_9ThwN-QpVYC . Manchester, N. H.: William E. Moore, (1890) , p. 528. 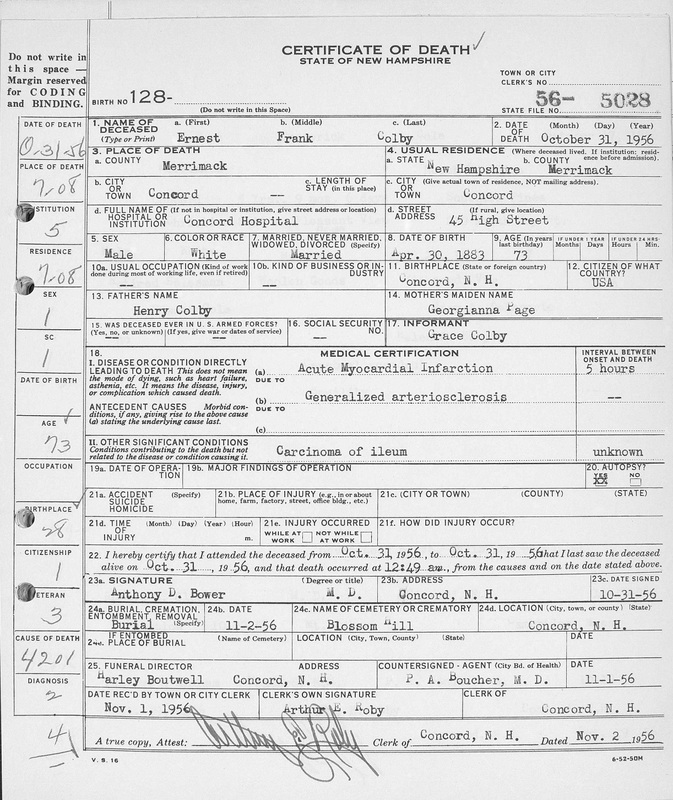 "New Hampshire Death Certificates, 1938-1959," database with images, FamilySearch (https://familysearch.org/pal:/MM9.3.1/TH-1942-29032-20309-23?cc=1876925 : 20 August 2014), 1956 > No 4854-5398 > image 179 of 551; New Hampshire Division of Vital Records, Concord. "United States Census, 1900," database with images, FamilySearch (https://familysearch.org/ark:/61903/1:1:M3YD-S6S : accessed 6 April 2016), Henry A Colby, Concord city Ward 2, Merrimack, New Hampshire, United States; citing sheet 6A, family 132, NARA microfilm publication T623 (Washington, D.C.: National Archives and Records Administration, n.d.); FHL microfilm 1,240,949. 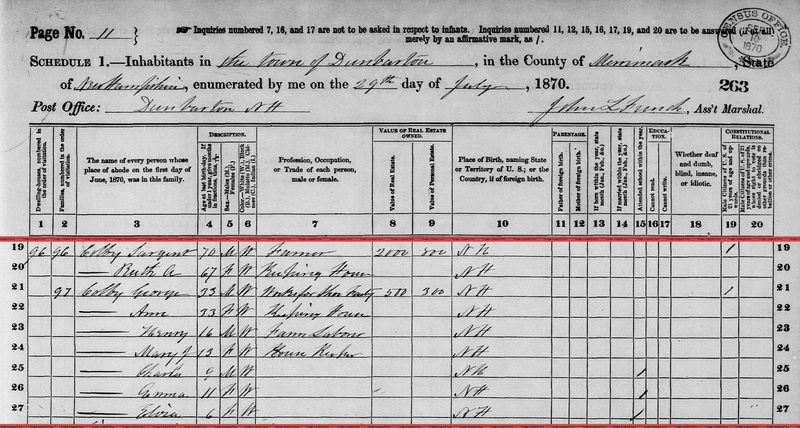 "United States Census, 1910," database with images, FamilySearch (https://familysearch.org/ark:/61903/1:1:MLZZ-6LJ : accessed 6 April 2016), Henry A Colby, East Concord Ward 2, Merrimack, New Hampshire, United States; citing enumeration district (ED) ED 192, sheet 4B, NARA microfilm publication T624 (Washington, D.C.: National Archives and Records Administration, n.d.); FHL microfilm 1,374,877. 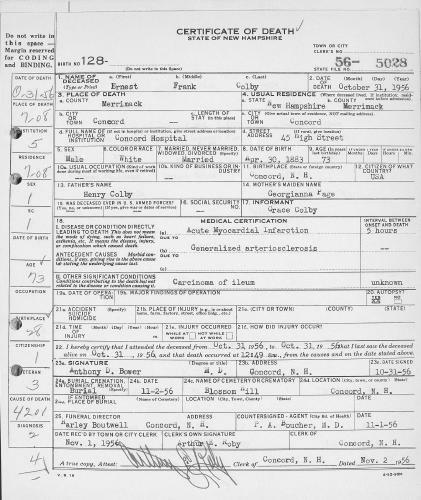 "United States Census, 1930", database with images, FamilySearch (https://familysearch.org/ark:/61903/1:1:X7NK-DL7 : 8 December 2015), Addie B Colby in entry for Ernest F Colby, 1930. She was the daughter of John Colby and Maria Davis. Esther died on September 6, 1873 in Bow, Merrimack County, New Hampshire, at age 64. 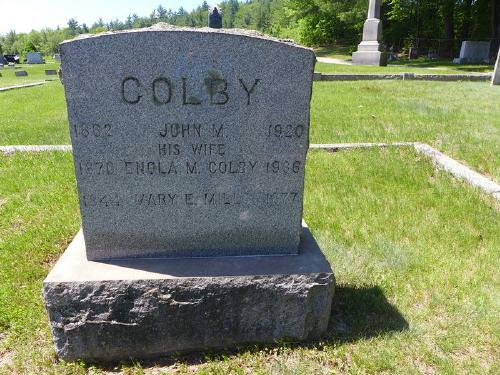 COLBY FAMILY & OTHERS, at http://freepages.genealogy.rootsweb.com/~colby/colbyfamshowing gravestone image. COLBY FAMILY & OTHERS at http://freepages.genealogy.rootsweb.com/~colby/colbyfam, /d118.html.